These pages flip! 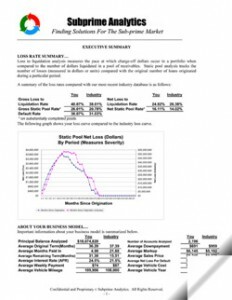 Simply click on the sample report links below and use your mouse to flip through the pages. Please wait for pages to load. The Executive Summary summarizes your loss rates and ROI compared with you industry peers and identifies differences. The summary provides specific information about your business model, and presents an anatomy of your BHPH repossessions. Our findings on the three key elements of your deals (customer, vehicle and deal structure) are explained and suggestions for improvement are summarized. If you aren’t using analytics today, you won’t be borrowing money tomorrow. This was a quote from a major capital provider in 2008. His statement has proved to be prophetic. 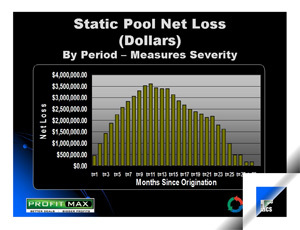 Static pool measures the frequency and severity of portfolio losses measure over the life of loan pools. 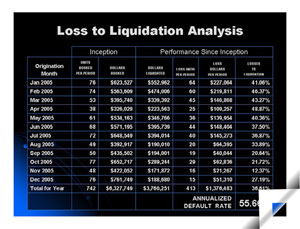 Loss/Liquidation analysis measures the pace of losses during the life of the loan pools. Together, these metrics can be used to project future performance. Understanding your loss performance metrics is important, but identifying what causes these losses is equally important. Our proprietary “drill down” technology touches each loss and shows you what is working best and what’s not working. Our findings allow you to make underwriting adjustments required to improve your performance. 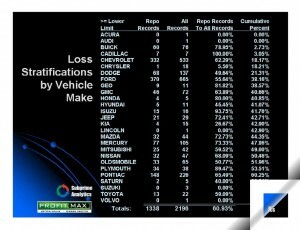 Our stratifications provide specific insights into the individual performance of the vehicles you sell and all the deal characteristics (down payments, repayment, markup, etc.). 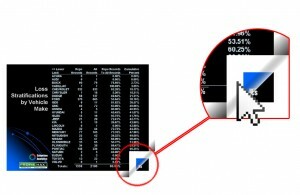 This information can be used to create your own scoring system or utilize our companion web-based system Profit Max. Subprime Analytics has been visited 1,685,065 times.